I came to know from my schoolmate, BT that her mother is good at making homemade steamed buns (pao), be it with char-siew (barbecue pork), lotus paste or sweet potato stuffing. Her 4-years old son likes them a lot. When I expressed my eagerness to learn from her mother, she had immediately obliged to my request and arranged a bun making session for me with her mom when I was back home in Penang recently. On that day, her mother demonstrated to me how to make the steamed char siew and sweet potato buns. Both buns were made from the same dough. I only documented the latter for sharing as I found that it is easier to learn for novice like me. As it turned out, the buns were very soft and fluffy, and best eaten when they were just fresh out from the steamer. Here, I like to express my special thank to BT for this special arrangement and also my deep appreciation to her mother for letting me learn her secret steam buns recipes, and allowing me to “invade” her kitchen. Did you notice that all the steamed buns shown in this post are of uneven shapes? They were done by me. Her mother was kind enough to let me try my hands in shaping these buns. She said taste is more important than shape, and I passed her test! LOL! 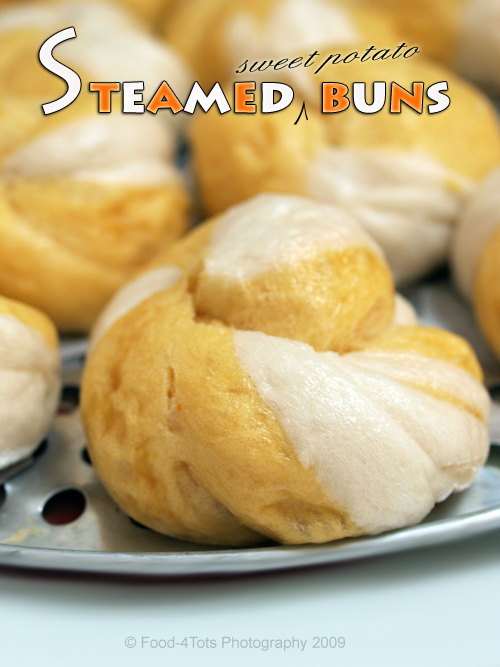 >> Click on page 2 below for Steamed Sweet Potato Buns recipe………………..
You know what, my mom told me a few weeks ago she made steamed sweet potato buns!! After I heard that, I wish I could just fly back and enjoy the buns! Now I have your sweet potato buns in front of me.. sooo unfair! :(hahah..
Where can I get Hong Kong flour? 🙁 Do you think the normal flour is suitable? By the way, I have a hillarious buns-making-experience (after seeing the sausage buns you and Gertrude made).. I will share with you guys later.. LOL!! Lee Mei: I am sure your mom will make them again when you go back. She must be a great cook. Any great recipes for sharing? OK – I will check out the flour and shortening. 🙂 Thanks! You measure each ingredient next time you go home or she comes to you. We had a family recipe for a sweet chocolate sauce for breakfast over biscuits (Chocolate Gravy) and my sister did that. Measured every little bit she added. We have a better success rate than Mom did as every once in a while her recipe didn’t quite work out as well. Ours works every time because we had her take it out of her head and put it on paper for all the family. Good luck. Wah, got sifu to teach. Finally you pick up the skill. 🙂 I never try to make pao or bread before. Wait till I build up the foundation first, hehe. As a newbie, your outcome look good! In fact, thanks for compiling my mum’s recipe for me. I have been saying that I will jot it down ONE DAY……. but I only keep on enjoying the bun without bothering to learn how to make. The pictures look nice and thanks for your systematic approach. Beautiful steamed buns! The color very attractive. Thanks for sharing the recipe with step-by-step pictures. It’s very useful. Cheers! Thanks so much for sharing the recipe! I tried to make my own bao before but it’s hard and also turned yellowish after steaming. I’ll try out your recipe soon! I really like this pao. Everytime I go back to Penang, I will buy the “huan choo pao” which is all yellow in color. Yummy! I am totally steamed now after staring all you love steamed food creation! joyly awesome! Looks like a really fluffy buns for tea. I won’t mind the extra calories. The buns are beautiful! Thanks for sharing! My fren is comin frm Sg tis Sat, and bought me a SGD130 Red Man breadmaker! He actually recom the BlueSky in Carrefour which is like SGD69 only but whn i wanted it its discontinued! Wish I can have some of your pao for breakfast now. Thanks for sharing the wonderful recipe and step by step on how to make it with it. 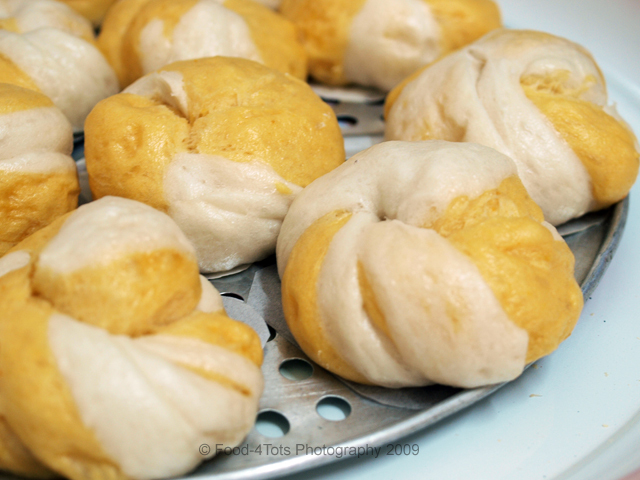 Great photos showing step by step instructions of doing the bun instead of just recipe. Just great to see this healthy bun done by you will full illustration…keep it up LK! CK: Tks!! I only helped to shape the buns. It was all the hardworks from my friend’s mother. Oh, looks so beautiful! I love the colors combination. These look incredible! The color is so lovely. look so soft and pretty!! i bet it’s really taste good!! Just figured I missed so many of your wonderful posts! My google reader didn’t update your rss feeds for some weird reason! Hi I tried a couple of your recipes and my daughter and husband loved it! Am interested to try your steamed sweet potato bun recipe but the link for page 2 does not seem to be working. Would it be possible for me to get the recipe via email? I was thinking of making Paos for quite sometimes but never had enough courage to try once. I stumble upon your sweet potatoes paos a short while ago and keep coming back looking at it lovingly (I love orange color foods ;). I have to make it this weekend (I mean “try”) and hoping that it will be a success. I just wonder if you ever try or think of subtitute pumpkin for sweet potatoes. Sorry for the late reply. Tks for dropping by at my blog. I haven’t tried making this bun on my own but I think it should be alright to subsitute it with pumpkin. Otherwise, you can try this pumpkin bun recipe from this food blogger. Hope it helps. C: These buns were done by my friend’s mother who has a Kenwood bread machine. For myself, I only use Kitchen-Aid standing mixer to knead my bread. Hi, am looking forward to try this out! looks great! i do not own a bread machine. would it be possible to use the normal electric mixer? Are u able to share recipe on basic dough for chinese steamed bun? I wud like to use dough for pork, char siew buns. I am trying to figure out how to use the dough in your steamed sweet potato bun but I had better not take the risk. I rather request from you just the basic bun dough. Thanks Food 4 tots for the recipe links. Thanks for sharing this recipe. I’m wanna try it out soon but I have a few questions. 1) is there any way I can substitute shortening with something else? 2) when I place one slice of white dough on top of one slight of orange dough, seal the sides and pull slightly, I just twist them and finally pull the top end down to meet with the bottom end? Is that correct? Rachel: It’s my pleasure to share. According to this link (http://allrecipes.com/HowTo/common-ingredient-substitutions/detail.asPX), you can substitute 1 cup of shortening with 1 cup butter OR 1 cup margarine minus 1/2 teaspoon salt from recipe. Your way to form the bun is correct. Happy trying!!! I love this recipe but if i’m going to make only around 8 buns, what are the changes for the ingredients? 41 queries in 0.308 seconds.